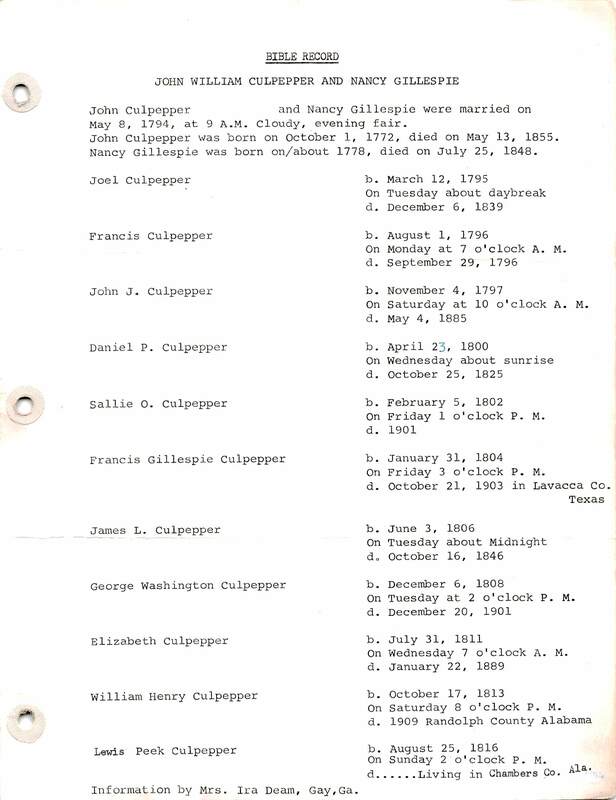 Full death dates were recorded for John and Nancy (Gillespie) Culpepper and all of their children except for William Henry and Lewis Peek Culpepper. A note was made after William Henry's birth record noting that he had died "1909 Randolph County Alabama." The note after Lewis Peek Culpepper's birth record read "Living in Chambers Co." So the record appears to have been copied sometime after 1909 and before 1915 when Lewis Peek Culpepper died. The Bible is not known to be in the possession of any of the descendants of William Henry or Lewis Peek Culpepper or of Mrs. J. W. (Ira Gay) Deam. There is a possibility that the Bible was still in existence 8 Oct 1942 when Rev. George Bright Culpepper wrote "ONE FAMILY - CULPEPPER" a 25 page typed, double-spaced summary of the descendants of Daniel Peek Culpepper. Rev. Culpepper wrote about Daniel Peek Culpepper's father: John William Culpepper was born in Richland District, fork of the Congaree and Wateree Rivers, South Carolina, October 1, 1772, according to the record in his family Bible, set down in his own hand. The statement raises several questions, one of which is, did Rev. Culpepper have the Bible when he wrote this or was he working from a copy of the record or from other notes. Rev. Culpepper later made reference to "my scrapbook" which had information about the family. A granddaughter of Rev. Culpepper, Mrs. J. D. (Dorothy Culpepper) Wingfield, wrote 12 May 1993 that "I have no idea whether Geo. B. ever had possession of that bible." 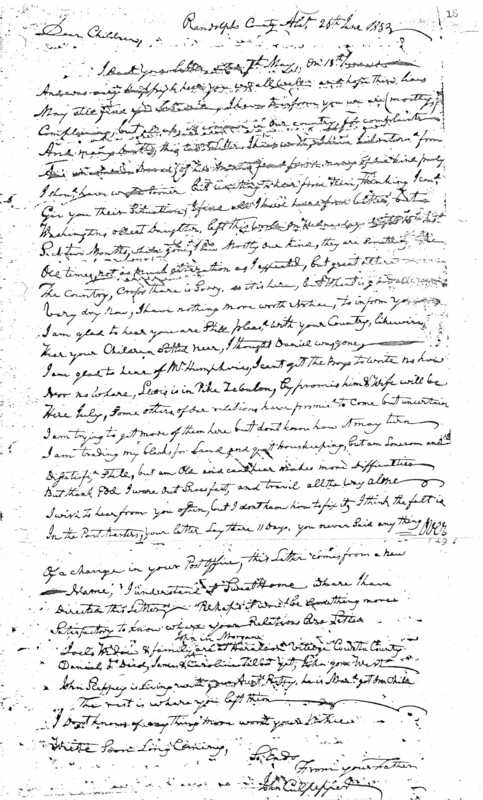 If only we had the letter that Lewis Peek Culpepper wrote to his son, we might be able to see if he had actually named his father "John William Culpepper" or if he had named both his father and grandfather "John Culpepper" and Joseph Richard Culpepper had used the "John William Culpepper" from the history in an attempt to reconcile the alleged history with what his father had written and in order to clearly distinguish his grandfather from his great-grandfather in his letter to Rev. Culpepper. In any event, the source of the name "John William Culpepper" was probably the alleged history of the family and Rev. George B. Culpepper would probably have considered Joseph Richard Culpepper's letter a confirmation of the name because Joseph Richard appeared to have been reporting information that he had gotten from his father, Lewis Peek Culpepper. The only other indication of John Culpepper's middle name, if any, is an 1829 Upson Co., GA deed (A 434/5), in which John Jefferson Culpepper deeds land to his father for $5.00, the father's name is listed not once but three times as "John C. Culpepper." The clerk was trying to distinguish the grantor "John J. Culpepper" from the grantee "John Culpepper" and used "John C. Culpepper" to distinguish the two. Since John Culpepper, Senior was not illiterate, the "C" cannot be interpreted as his "mark." But if John Culpepper's middle initial was "C." he did not pass the name to any of his sons. And only one grandson of John Culpepper is known to have a name starting with "C," Charles William Culpepper, a son of Joel. Could John Culpepper have had a middle name of Charles? It would have been a common name for a supporter of the Stuarts but would have fallen out of favor after the Revolution. Joseph went on in the letter to note that John Culpepper "moved from Virginia to Congaree, South Carolina and then to Edgefield [SC] and from Edgefield to Monroe County, Georgia and later to Meriwether County, Georgia, and to Randolph County, Alabama, where he died in 1855, when I was 12 years old" and not in 1852 as in the alleged history. Again it it not possible to know if Joseph Richard Culpepper was still trying to reconcile the alleged history which said that "John William" was born in Virginia with what his father had told him about the movement of the family. However, in the 1850 census of Randolph Co., AL (p. 386, family 189), John Culpepper gave his place of birth as South Carolina. No records have been found in South Carolina for John Culpepper's presumed father, John. The elder John is believed to have lived in Camden District, SC in an area that became Richland District, SC and many early records for this district were destroyed. If the parents of John Culpepper died young, possibly before or during the Revolution, and John was their only child, then it is unlikely that any record of their existence, outside of family tradition, will ever be found. In trying to identify where John Culpepper was born, it is necessary to look at the extant Culpepper records in districts that existed at the time of his birth. In 1769, the Province of South Carolina was divided into seven districts, three of whom have Culpepper connections: Cheraws, Camden and Orangeburg. Cheraws District was bounded on the west by the Lynches River and the Pedee River ran through the center of it. Nancy Gillespie, who married John Culpepper, is believed to have been born in this district. Joseph Richard Culpepper noted that "Congaree, South Carolina" was one of the places where John Culpepper had lived and Rev. George Bright Culpepper indicated that "John William Culpepper" had been born in "Richland District, fork of the Congaree and Wateree Rivers." Richland District did not exist at the time John Culpepper was born but the Congaree River was part of the Western boundary of the Camden District. The Wateree River ran through the center of the district which was bounded on the east by Lynches River and Cheraws District. The Wateree then joined with the Congaree to form the Santee River. On 3 Apr 1772, Joseph Culpepper, a presumed uncle of John Culpepper, received a grant by "George the Third... Four hundred Acres, situate in Craven County on Tom's Creek, in the fork between Santee River & the Wateree, bounding all sides on Vacant land." Tom's, Thom's or Thomson's Creek as it was known was halfway between the Wateree and Congaree near the confluence which forms the Santee river and was south of present day Columbia, SC. The land was listed as being in "Craven County." This was one of three counties established in 1682 and although it had ceased to exist in 1769, it was still used in land transactions to help specify the location of land. 22 Aug 1771, Liddy Culpepper, a presumed grandmother of John Culpepper, was granted 350 acres of land on Griffin's Creek which has not been located but was listed as being "in Craven County on the Fork of the Wateree and Congaree River." If any South Carolina land was granted to John Culpepper's father before the Revolution, no record of it has been found. If John Culpepper was born at the fork of the Congaree and the Wateree Rivers then he would have been born on the land of his presumed grandmother in Camden District, SC in an area which later became Richland District, SC and which today would be located just south of Columbia, Richland Co., SC. After the Revolution, in 1785, counties were formed within the districts which had been defined in 1769 but the district boundaries were maintained. The area in which Joseph and Liddy Culpepper had received grants of land was then considered to be in Richland County. In the first census of the United States in 1790, Benjamin and Joseph Culpepper, presumed uncles of John Culpepper, were the only Culpepper's listed as heads of household in South Carolina. They were both listed in Orangeburg District. This district ran southwest from the Congaree and Santee rivers to the Savannah River. John Culpepper probably moved across the Congaree River to Orangeburg District, SC with his presumed uncles and with his presumed grandmother, if she was still living. It is possible that John Culpepper was one of the three males age 16 and older recorded in Joseph Culpepper's household in the 1790 census of Orangeburg District, SC. . In 1793, John turned twenty-one and on May 18th of the following year he married Nancy Gillespie. Presumably, they would have married in the county where Nancy was living but it is not known whether this would have been Cheraws or Camden district. Since Nancy's uncle, Daniel Peek, left an estate in what was then Richland District (Richland County was part of Camden District in 1793), it possible that the marriage took place in Richland Co., SC. Mrs. J. W. (Ira Gay) Deam preserved the following John Culpepper Bible record which was copied by Mrs. D. W. (Lavyn Wright) Sisco: John Culpepper Senior(?) and Nancy Gillespie were married on May 8, 1794, at 9:00 A.M. Cloudy, evening fair. In "ONE FAMILY - CULPEPPER" a family summary written 8 Oct 1942, Rev. George Bright Culpepper also references the Bible record of John's marriage: According to the same record, John William Culpepper married Nancey [sic] Gillespie on May 18, 1794, the ceremony being performed by Reverend Reese, at his house on the Congaree. It was on Sunday, cloudy in the morning and fair in the evening. Again, it is frustrating not having the actual Bible record. Which copiest made the error in the date? Was the name really "John William Culpepper"? Supporting Rev. Culpepper's version is that fact that 18 May 1794 actually was a Sunday. The location on the Congaree is logical but was it on the Richland District side or on the Orangeburg District side? What was Rev. Reese's first name and where was he located in the 1790 census? There was a Joseph Reese that had land near Joseph and Liddy Culpepper before the Revolution. The Bible records apparently also mention the exact hour of birth of each of the couple's eleven children, a penchant for detail which would continue in more than one branch of the family. In 1785, Lexington County was one of the counties set up in the Orangeburg District. It was directly across the Congaree River from Richland County in Camden District. The county was abolished in 1791 but was reinstated as a district in 1804. John Culpepper, age 16-26, was listed as a head-of-household on the 1800 census in the Lexington portion of Orangeburg District, SC. Depending on when the census was taken, John would have been 27 or 28 years old. John was living with his wife and three sons near (1 census page after) Joseph Culpepper. There was also one girl 0-10 years of age that has not been accounted for since the first daughter born to John and Nancy's first daughter, Sarah, was not born until 1802. Since Daniel Peek Culpepper was born in April of 1800, it is possible that this was a young relative who was helping out the new mother. In a 2 Feb 1898 article about Francis Gillespie Culpepper, John Culpepper's son, which appeared in the Shiner Gazette Francis Gillespie was reported to have born in Edgefield District, SC. Francis was still living in 1898 and presumably would have been the source of this information. In addition, another son, Lewis Peek Culpepper, read this same article and found it "a tolerable correct historical account." The obituary of another son, George Washington Culpepper, also gave his place of birth as Edgefield District, SC in 1808. Edgefield District was to the west of Lexington District with which it shared half of its southeastern border. It was bounded on the southwest by the Savannah River which formed the boundary between South Carolina and Georgia. Francis Gillespie was born in 1804 and George Washington Culpepper was born in 1808 but John Culpepper does not show up in Edgefield District land records until 1814. Although the John Culpepper family appears to have been in Edgefield District at least by 1813, it is doubtful that the family was there in 1804. It is more likely that the family was still in Lexington District in the early 1800's. The land was bounded by Frederick Slappey, Matthew Bassett, and others. Cuffey Town Creek parallels the Abbeville District border. John Culpepper and his family were still living in Edgefield District, SC in 1816 when the youngest child, Lewis Peek Culpepper, was born. John does not appear as a head of household in 1820 census, but is presumed to have been living in Edgefield District, SC with his family since in February 1823, John sold 144 acres "where I now live" on Cuffee Town Creek to Josiah Langley for $800. This parcel was one granted to George Shelnut, not his own 138 acre grant, the sale of which was not recorded. It is possible that one of John's married sons or daughters had been left living on the original parcel. The lot John sold in 1823 adjoined Josiah Langley and the heirs of Robert Bell, one of whom was John Culpepper's son, John Jefferson Culpepper, who had married Bell's daughter Catherine. This appears to be the land that William Bell was living on in the 1820 census of Edgefield District, SC. Perhaps John moved his family from his Edgefield District grant land to this lot between 1820 and 1823. John and Nancy moved to Georgia when their son, Lewis, was seven, about 1823 or 1824. This would be in line with John's sale of the 144 acres "where I now live" February 1823 in Edgefield District, SC to Josiah Langley. At least two and possibly three of John and Nancy's children moved out ahead of them. Daniel Culpepper's son, James Marion Culpepper, was born Feb 1823 and based on later census records he was born in Georgia. No records have been found showing where the family was located at the time but James Marion's son, Rev. John Butler stated that his father was born in Baldwin Co., GA. Based on later census records, Sarah (Culpepper) Elliott's daughter Cynthia was also born in Georgia circa 1823. A specific place of birth is not known. Another son, John Jefferson Culpepper, and his family might also have moved on ahead although there are no records that any children were born to them during this time period. Baldwin Co., GA would have been on the route between South Carolina and Monroe Co., GA where the family finally emerges in land records. 3 Jan 1827, "John Culpepper Sr. of Monroe" bought 202 1/2 acres (Lot 223 Book E p. 179 witnessed by James Wilson and E. Dodson, recorded 20 Nov 1827) in the Twelfth District of Monroe County, GA for $800 from Warren T. Castleberry and sold it the next year for the same price. This would seem to show that John was already in Monroe before he bought the land. G. W. Elliott, witnessed the 1828 deed. It is not known if he was related to William Elliott, the husband of John Culpepper's daughter, Sarah. By 1830, John and Nancy had only one son, Lewis, still living at home with them in Monroe County, GA. Living nearby was Mary (Corley) Culpepper, widow of John's son, Daniel. Sometime between 1830 and 1832, John and Nancy apparently moved on to Crawford Co., GA where there sons Joel and James had been recorded in the 1830 census. "John Culpepper, Sen[ior]" of "Marshall's, Crawford" drew lot 174 in the 22nd district of section 3 of the 1832 Cherokee Land Lottery of Georgia. As a married man who was a U. S. citizen with a son under 18 years of age who was a U. S. citizen and who had lived in Georgia for three years, he would have been entitled to two draws. The land was a 160 acre lot located in the southeast corner of what was Floyd Co., GA and is now on the southern border of Bartow Co., GA near where Paulding and Cobb Co. meet the Bartow Co., line. No record has been found of John and Nancy moving to the land, nor has any record been found of the sale of the land. The family is next noted moving on to Meriwether Co., GA. In the mid-1830's, John and Nancy Culpepper moved to Meriwether County, GA along with son, William Henry Culpepper, and his family. Another son, George W. Culpepper, was already living in Meriwether Co., GA. John and Nancy bought land there in 1838. 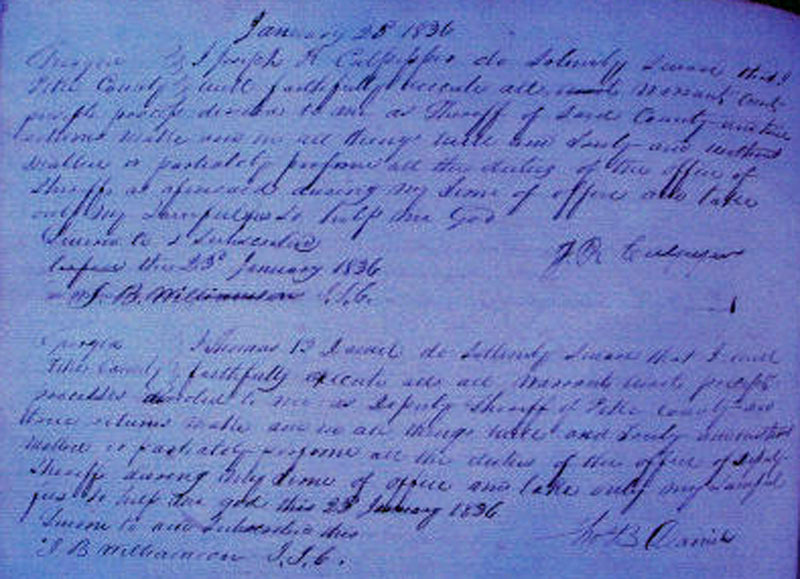 A descendant, John William Culpepper, obtained a copy of deed F-396 in which, on 24 May 1838, Eli Peavy sold 50 acres on the north side of land lot #255 in the 8th District of Meriwether County, Georgia, containing 50 acres to John Culpepper for $35.35. John and Nancy were noted in the 1840 census of Meriwether Co., GA (p. 123, John Culpepper 1 male 60-70 with 1 female 50-60 living next to son, William H. Culpepper). The following is an account of John Culpepper as a settler in Greenville, Meriwether Co., GA which appeared in the Greenville, GA Vindicator on April 21, 1905: Nearly eighty years ago a group of hardy yeomanry settled on adjacent farms a few miles northwest of Greenville near the old Ector mill (now Maffett's). They were John, George and William Culpepper, Allen, Eli and David Peavy, Freeman Blount, Daniel Keith, Joel Sears, William Sutherland, Robert Kendrick, James Martin and the Carlisles. At that time these denizens were neither rich or very poor, but self-reliant, self-sustaining and mutually helpful in many ways. Then and in many sequent years it was customary in the country to have log-rollings, house-raisings and wheat-reapings in which the neighbors joined forces either personally or by colored proxy. In the dark hours of sickness, death, or misfortune of any kind the sympathetic hearts and hands of the neighborhood were promptly united to assist and relieve the distressed. This was especially the era of the best men and women of Georgia and from such have sprung those who have done most in the private and public walks of life to conserve true nobility of character, moral and christian civilization. John Culpepper removed in early life from Virginia [according to the 1850 census record, he was born in South Carolina and all indications are that his extended family had recently moved to South Carolina when John Culpepper was born] to South Carolina thence emigrating to Monroe county, Georgia from where he came to Meriwether locating on what is now known as the Willis Jarrell place near town. After residing here some years he disposed of his farm reinvesting in a choice plantation in Randolph county, Ala. Then he spent the remainder of his long life contentedly as he harvested luxuriant crops from the alluvial lands bordering on the Chattahoochee [read Tallapoosa River?]. He belonged to the honest primitive class of citizenry who scorned deceit, lying and trickery, esteeming true character and a good name above filthy lucre and corrupted honors. Though not a churchman, the old patriot was a firm believer in the christian religion as was attested by his conduct in the practice of its precepts. He was the father of eight sons and two daughters, all of whom located in various parts of this state and Alabama. All were substantial highly respected citizens, reflecting honor on their special callings and the name of their revered ancestor. This is a remarkable family for longevity. All attained very old age some of them having lived more than a century. Land Lots 225 & 226 [255? & 256? ], 8th District are located approximately 2 to 3 miles northwest of Greenville, about one mile east off of Georgia Route 100 on the Jarrell road. 255 cuts across Jarrell Road. Eleanor [Willingham] and I located a cemetery nearby lot 255 and just off of the Jarrell Road and it had a number of Peavy graves but no Nancy Culpepper. It is not clear at what point, John Culpepper moved on to Randolph Co., AL. According to Meriwether Co., GA Deed I-392 obtained by John William Culpepper, John Culpepper and William H. Culpepper sold for $1,000 to Jacob Moon the Meriwether Co., GA District 8 lot 256 containing 202 1/2 acres which George Washington and William H. Culpepper purchased in 1838 half of which John Culpepper purchased from George Washington and William H. Culpepper in 1842. John and William H. Culpepper also sold as part of the package the 50 acres off of the north side of lot 255 which John Culpepper had bought in 1838. The question that this raises is whether or not John Culpepper moved to Randolph Co., AL before or after Nancy's death. According to Mrs. J. (Clara Haralson) Moorcroft, writing about her grandparents in "THE WILLIAM CULPEPPER AND SALLY LESLIE FAMILY," Clara's mother, Sarah Jane Culpepper, was six years old when the William Henry Culpepper family moved with the widowed John Culpepper from Meriwether Co., GA to Randolph Co., GA. Sarah Jane Culpepper would have been six years old in 1850 and in fact both William Henry and the widowed, John Culpepper were listed in the 1850 Randolph Co., AL census. However, "William H. Culpepper" is noted in Randolph Co., AL land records in 1848. He bought or was granted 39 acres and 24 rods of land (Certificate or Warrant 10628) in the southwest part of the northeast division of Section 10 in Township 22 South, Range 10 East of Randolph Co., AL. The land appears to be to the west of Wadley about half way between the town and Pleasant Hill Church. All records on William Henry's youngest daughter, Caroline F., show that she was born in January 1849 in Alabama. This would seem to verify that the family was already in Alabama by 1849. If John Culpepper was a widower, then it appears that the William Henry Culpepper family moved to Randolph Co., AL with William Henry's father around the time that William Henry Culpepper purchased land there in Aug 1848 and after the July 1848 death of Nancy (Gillespie) Culpepper. A 78 year old John Culpepper was listed (p. 386, family 189) on the 1850 census in Randolph County, AL living nearby his son, William Henry (p. 386, family 183). John listed his birthplace as South Carolina and he owned $5,500 worth of real estate. An 8 year old grandson, Lewis W. Culpepper, a son of William Henry Culpepper, was also listed as living with his grandfather. Unfortunately no record has been found of the land that John Culpepper bought in Randolph Co., AL but based on census records it must have been very close to William Henry's land and probably at least four times as large based on the amount of real estate he was supposed to have owned. Section 11 which covers the western portion of Wadley was already accounted for by early settlers (1835 - 1837) with the exception of one 40 acre portion that William Henry Culpepper purchased in 1855 (poor ink makes the entry almost impossible to read). Section 10 where William Henry had his land seems to be similarly accounted for by people who settled in the late 1830's and 1840's with the exception of another piece of land that William Henry purchased in 1855 which was a parcel immediately north of his own land. The records of Section 3 which was immediately north of Section 11 are in many cases impossible to read because of the poor ink. The entry for John J. Culpepper's land is still legible. It is about the right size to account for the amount of property that John Culpepper owned in 1850 and it is near enough to William Henry to account for the proximity of the census records. Is it possible that John Culpepper actually owned the land that John J. Culpepper was noted with in the 1850 land record? But according to the letter which follows, John Culpepper had broken up housekeeping by 1853. The question is then where was he living when he died. One possibility is with William Henry. The other possibility is with his daughter, Sarah (Culpepper) Elliott. The Wadley City Cemetery, which is in this grid area, was originally named the Elliott Cemetery and was presumably on land owned by Sarah (Culpepper) Elliott, John Culpepper's daughter. She is believed to have been in the area before 1855 since one of her sons married in Randolph Co., AL in 1855. Sarah was also recorded in the Almond P. O. district in the 1870 census but was not living close to her brothers. In the 1880 census, she was recorded in the Louina P. O. district whereas William Henry was in the Flatrock district. This suggests that she was probably living in the Wadley area. In the 1853 letter which follows, John Culpepper writes of trying to get some of his children to come to Randolph Co., AL. It is possible that Sarah came shortly after this and settled on land that John Culpepper had purchased and that the Wadley City Cemetery land and the land to the south of Wadley where John Jefferson Culpepper descendants were found was at one time owned by John Culpepper. In 1853, John Culpepper wrote a letter to his son Francis G. in Lavaca County, Texas, which has been preserved all of these years by that branch of the family. He mentions various relatives but unfortunately does not tell us anything of his own ancestry. John died in Randolph County, AL, May 13, 1855. I rec'd your letter, dated 7th May, on 13th June And was very happy to hear you was all well and hope these lines May still find you Likewise. I have to inform you we are (mostly) Complaining, but all up, its common in our country for complaints And many Deaths, this is 3rd Letter I have wrote, I have just return'd from An uncommon Broad (of two months) and found many of our kin poorly. I shou'd have wrote Sooner but waiting to hear from them, thinking I cou'd Give you their Situation, I find all I have heard from better, but Washingtons oldest Daughter, left this world on Wednesday night 15th last. Sick two months. While gone, I saw mostly our kind, they are something like Old times, not as much alteration as I expected, but great alteration in The Country, Crops thare is Sorry, so it is here, but Wheat is good all over. Very dry now, I have nothing more worth Notice, to inform you. I am glad to hear you are Still pleas'd with your Country, likewise Hear your Children settled near, I thought Daniel was gone. I am glad to hear of Mr. Humphries, I can't git the Boys to write no how nor no whare, Lewis is in Pike Zebulon, by promise him & wife will be Here July, Some others of our relations have promis'd to Come but uncertain. I am trying to git more of them here but don't know how it may turn. I am trading my blacks for Land and quit Houskeeping, but am Lonesom and Dissatisfi'd, Stile, but am Old and cant hear makes more difficulties. But thank God I wore out Shoes fast, and travil all the way alone. I wish to hear from you often, but I don't know how to fix it, I think the falt is In the Post Masters, your letter Lay there 11 days, you never Said anything of a change in your Post Office, this Letter comes from a new name, I understand it Sweet Home whare I have Directed this Letter. Perhaps it wou'd be something more Satisfactory to know whare your Relations Are Settled. Joels Widow & family (John in Morgan) are at Haralson Viledge Coweta County. Daniels d[itt]o Dead, James & Caroline Talbot yet, John gone West. John Slappey is Living with your Aunt Betsy, he is mar'd got One Child. "Washington's oldest daughter" mentioned in the letter was Nancy Louisan, daughter of George Washington Culpepper, of Meriwether Co. GA, who died June 16, 1853, at 11:25 A.M., according to the G.W.C. Bible record. "I thought Daniel gone" refers to Daniel Fey Culpepper, the son of Francis Gillespie Culpepper. He did not leave Lavaca Co. TX until around 1900, and died shortly thereafter in Devine, TX. "Lewis is in Pike Zebulon, by promise him & wife will be Here July" refers to Lewis Peek Culpepper, the youngest son of John W., who lived in Zebulon, GA until 1859, when he moved to Randolph Co. AL. In a letter written in the early 1900's to Rev. George B. Culpepper, a son of Lewis, Joseph Richard Culpepper, mentions going with his father to visit John Culpepper when Joseph was 12 years old, i. e., in 1853. John Culpepper was not listed as a slave-owner in the 1850 slave schedule of Randolph County, Alabama so it is not clear when or where he got the slaves that he intended to trade "for land." "This letter comes from Sweet Home" refers to the name that Francis Gillespie Culpepper gave to the land when he arrived in Lavaca County, TX, in the spring of 1851. According to his granddaughter, Jessie Burke Heard, "he stopped the wagons and told the people that this was the place he wanted to make his home, so he then and there named the place Sweet Home." "Joel's widow and family (John in Morgan) are at Harelson Viledge" refers to Nancy (Corley) Culepper, widow of John's oldest son, Joel, who was in Coweta County, GA in 1850, as were her children, Charles W., Sara A. B., James Benjamin, and Elijah Milton. "John in Morgan" refers to Nancy's oldest son, John L., who was in Morgan Co. GA, and was later killed in the Civil War, at Winchester, VA, on Feb 24, 1862. "Daniels d[itt]o Dead" is a problem. If it was a reference to his son, Daniel P. Culpepper, as a mental note before going to talk about Daniel's children, James and Caroline, then it is odd since Daniel would have been dead for over 25 years and Francis Culpepper would have known that. If it referred to the fourth son of Joel and Nancy, then it is odd that the death was not noted in the Family Bible of his sister, Mrs. I. W. (Sarah A. B. Culpepper) Sims who did note the death of her brother John in 1862. The abbreviated ditto symbol "do" is under the word Widow of the line above. Possibly the line should be read "Daniels [Widow] Dead" since Daniel's widow, Mary (Corley) Culpepper had died in 1851 the year when Francis G. Culpepper left for Texas and he might not have heard the news. "James and Caroline Talbot yet, John gone West" refers to James Marion Culpepper and Nancy Caroline Culpepper Cooper who were children of John's son, Daniel Peek Culpepper, who had died in 1825. James and Nancy Caroline were in Talbot Co., GA in 1850. Daniel Peek Culpepper's youngest son was John Francis Culpepper who died in Johnson Co. TX in 1916. "John Slappey is living with your Aunt Betsey." This reference is to Betsey (Gillespie) Denton Dixon, who was the sister of Nancy Gillespie Culpepper, the wife of John Culpepper. John Slappey or his wife were apparently her relatives. The Slappeys have not been located in 1850 census records. John William Culpepper, a great-great-great-grandson of John and Nancy Culpepper wrote about the Wadley City Cemetery in an 18 Aug 1994 letter: On one of the full length stone slabs covering one of the graves in the Wadley Cemetery, there is carving indicating the individual was buried in 1856. Many of the graves with such rock slabs have no carving. It is an old cemetery, and originally the Elliot family cemetery [John Culpepper's daughter, Sarah married an Elliott]. The grave with the carving is near the grave of Wm. Henry Culpepper [a son of John and Nancy Culpepper]. + George W. Culpepper, 6 Dec 1808 – 20 Dec 1901.
p 173 George W. (1 of 5 males 0-10 in hh of John Culpepper). John Culpepper, page 173, 5 M0-10, 2 M10-16, 1 M26-45, 1 F0-10, 1 F16-26, 2 F26-45, 16 slaves. J. W. Culpepper Bible Record, POB from Joseph R. Culpepper. Edgefield Deed Bk 43, p. 322. John Culpepper, 1 M10-15, 2 M15-20, 1 M50-60, 1 F50-60. John Culpepper, 1 M60-70, 1 F50-60. Biography* � Joseph Richard Culpepper was the son of Joseph Culpeper. From a record in Joseph Culpeper's Revolutionary War Pension File R. 2565 in which "Joseph R. Culpepper" authorizes Barnabas Strickland to prosecute a claim "for services rendered by my Father Joseph Culpepper in defense of his country in the war of the Revolution as Lieutenant in the Cavalry Company commanded by Capt. Alexander, belonging to the Brigade commanded by General Sumter." Since the marriage of Joseph's known wife, Ann Theiler, was her third, and since she is known to have had a child by her first husband by 1772, it is thought that she would have been past her childbearing years in 1795, the presumed year of Joseph Richard Culpepper's birth. However, no evidence has been found to show that Joseph Culpeper had another wife. Assuming that Ann was approximately the same age as Joseph Culpeper, or a little older, she would have been in her early to mid 50's when Joseph Richard Culpepper was born. And, although it is unusual for a woman to have a child at that age, there are precedents and there is no evidence that Joseph Richard had any younger brothers or sisters. Joseph Richard Culpepper is believed to have been born in the Lexington area of Orangeburg District, SC since that is where his father was noted in the 1790 census. The family was also noted in this same area in the 1800 census. Since his father was also named Joseph, Joseph Richard Culpepper went by his middle name, Richard, or, when he was younger, by the nickname "Dickey." Even after his father's death, when Joseph Richard began using his first name, he still signed his name Joseph Richard Culpepper. Joseph Richard's father, Joseph, died after 1807 and before the 1810 census. It is not known if Joseph Richard's family moved to Abbeville District, SC before or after Joseph's death. The family of "Joseph" Culpepper was noted in the 1810 census of Abbeville District,SC but the oldest male noted was 16 to 26 years of age. Joseph Richard Culpepper would have been 15 years old at most but if Joseph had still been alive at the time of the census, he would have been in his 60's. Joseph Richard Culpepper would have been approximately 17 years old when the War of 1812 began. On December 10, 1813, at the age of 18, he enlisted in Abbeville District, SC as a replacement for someone who had been drafted 14 He enlisted as Richard Culpepper, but applied for his bounty land and pension as Joseph R. Culpepper. Joseph was a private in the company of South Carolina Militia commanded by Captain John Hatter, in the regiment commanded by Colonel Youngblood. According to the pension record, the company "was marched to the burnt church near Beaufort in the state of South Carolina where they were stationed until near the close of their service." Joseph Richard served until March 15, 1814. Then, for two months in the Fall of 1814, Joseph Richard served as a corporal in the company commanded by Z. Meriwether in the regiment commanded by Col. Austin. This was the same company in which Joseph Richard's cousin, Joel, son of Benjamin, was serving as a 2nd Sergeant. Joseph Richard Culpepper is next noted in the 1820 census of Abbeville District, SC with his wife and two young daughters. Two older males and two older females were also noted in the household but have not been identified. In 1829, Joseph Richard moved his family to Pike County, GA. obituary, Christian Index and Southwestern Baptist, 28 Jun 1877 They were among the first white settlers there. He was still going by the name "Richard Culpepper" but, in the early 1830's, he started using the name "Joseph R. Culpepper." "Richard Culpepper" was noted in the 1829 Pike Co., GA Tax Diges[t in "Captain McDowel's" District. Later listings (1831, 1834, 1835, 1837, 1838) were for "Joseph R. Culpepper. "[:CIT] In the 1830 census of Pike Co., GA, Joseph Richard Culpepper was noted with his wife and young family of five daughters. There was also a 20-30 year old male living in the household who has not been identified. In May of 1836, Joseph Richard volunteered for three month's service in the Creek War which he called the "Florida War." from an 1852 letter preserved in the War of 1812 pension file SC-12308 He served as a private under the command of Captain Berry E. Lynch in the Georgia Regiment of Mounted Infantry commanded by Thomas Beale. After completing his service, Joseph Richard returned home. He would have been in his early 40's and it was possibly around this time that he served as High Sheriff of Pike Co., GA, an occupation which was noted in his obituary. Joseph Richard was recorded in the 1840 census of Pike Co., GA with his wife and three of their daughters. Four of the daughters married in the late 1830's and in early 1840. It is possible that the daughter that married in 1840 was recorded as living at home for the purpose of the census. There was also a 60-70 year old male living in the household, who has not been identified. In 1850, Joseph Richard was the census taker for his district. He recorded himself with his wife and youngest daughter in the 1850 Pike Co., GA census. September 28, 1850, Congress passed a "Bounty Land" act and Joseph Richard applied for land based on his service in the War of 1812 and in the Creek War. In a September 6, 1852 follow-up letter in Joseph Richard Culpepper's pension file, he noted that he was "entitled to 40 Acres for my serves in the Florida war [i.e., the Creek War] under Captain B. E. Lynch." The letter was written from Zebulon, GA. Joseph Richard Culpepper was apparently granted the land which he then sold. Then, in 1856, Joseph Richard Culpepper assigned power of attorney to Barnabas Strickland to see if he had a survivor's claim against the government for service by his father, Joseph, in the Revolutionary War. Joseph R. Culpepper and his wife were noted in the 1860 Zebulon, Pike Co., GA census. He was 65 years old and his real estate was valued at $1,000 and his personal property was valued at $2,982. Barbara R. Langdon, compiler, Edgefield Co., SC Marriages, 1769-1880: Implied in Edgefiled Probate RecordsLangdon, 1990, Repository: LDS Family History Library - Salt Lake City, Call No. US/CAN Book 975.737 V2L. Joseph R. Culpepper and ___ Geiger, Lived 1838 (Box 16, Pack 561, Frames 057). Joseph R. Culpepper, 1 M20-30, 1 M30-40, 1 F0-5, 1 F5-10, 3 F10-15, 1 F20-30. Joseph R. Culpepper, Crows District, Pike Co., GA, drew lot 241/8/4 in what became Murray Co., GA, 1832.
from Pike County Superior Court Minutes - 1823-1840. Joseph R. Culpepper, 1 M40-50, 1 M60-70, 1 F5-10, 1 F10-15, 1 F15-20, 1 F30-40. A. S. C. Culpepper, 19, F, GA.
Sylviah Culpepper owned 2 slaves: 6F, 3F. Biography* � In the Bible records of the John Culpepper family which were preserved by Mrs. J. W. (Ira Gay) Deam of Gay, GA, and copied by Mrs. D. W. (Lyvyn Wright) Sisco, John Culpepper's wife was recorded as "Nancy Gillespie" born "about 1778." Joseph Richard Culpepper, in a letter to Rev. George Bright Culpepper circa 1910-1915, wrote that Nancy Gillespie's "mother was a Peek." Mrs. John (Dorothy Culpepper) Wingfield preserved a 25 page typed manuscript "ONE FAMILY - CULPEPPER" written by her grandfather, Rev. George Bright Culpepper, who noted: According to the same [John Culpepper Bible] record, John William Culpepper married Nancy Gillespie on May 18, 1794, the ceremony being performed by Reverend Reese, at his house on the Congaree. It was on Sunday, cloudy in the morning and fair in the evening. As best it can be figured, Nancy Gillespie was six years younger than John William, the man she married, and was born on the Peedee River, in South Carolina, near Cheraw. The record recites that to this couple were born eight sons and two daughters. Nancy Gillespie is presumed to have been the daughter of Francis Gillespie of South Carolina since one of her sons was named Francis Gillespie Culpepper. Francis Gillespie owned land in Cheraws District, SC and family tradition is that this was where Nancy Gillespie was born. Francis Gillespie's wife was named Elizabeth based on South Carolina deeds (Book O-3, pp. 436-450) as was Nancy's sister Elizabeth "Betsy" Gillespie who married John Slappey (John Culpepper letter 1853). Nancy and Betsy Gillespie's presumed mother, Elizabeth, was perhaps a daughter or sister of Daniel Peek. In 1807, John Culpepper and John Slappey were listed as administrators of Daniel Peek's Richland District estate. The bond was also signed by Joseph Culpepper and George Slappey. Buyers at the estate sale included John Culpepper and John Slappey, Elizabeth Gillespie, and others. Prior to his death, Daniel Peek may have given land to John and Nancy Gillespie Culpepper which would account for their move back to Richland District, SC. 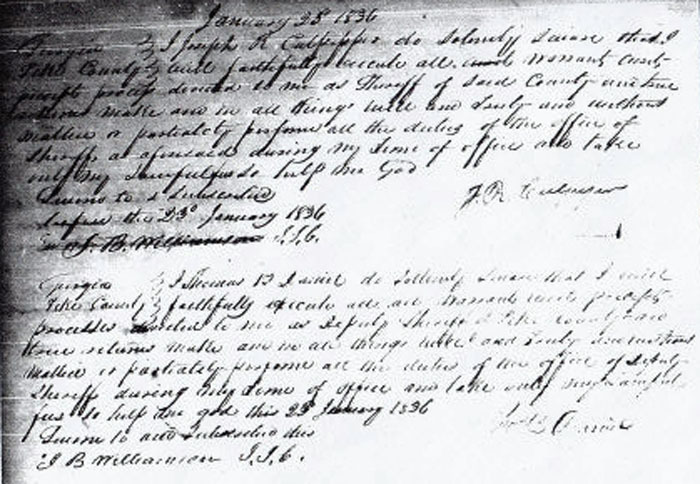 Daniel Peek's surviving estate records do not mention land but include sixteen slaves, several horses, hogs, and farm produce, indicating that he had been a planter and landowner. In Feburary 1823 when John Culpepper sold (Deed Book 43, pp. 322-323, Edgefield Co., SC) 144 acres "where I now live" on Cuffeetown Creek in Edgefield District, SC, this was not the land that he had been granted in 1814. Nancy Gillespy had to relinquish her dower rights to the land: John Culpepper____Deed._____South Carolina______ _____To_____________________Edgefield District____Know all Josiah Langley____men by these presents that I John Culpepper of Edgefield district in the State aforesaid for and In consideration of the Sum of Eight hundred dollars paid to me paid by Josiah Langley Senr of the State and district aforesaid have granted bargained sold and released and by these presents do grant bargain sell and release unto the Said Josiah Langley all that plantation or tract of land where I now live originally granted to George Shelnut Containing one hundred and forty four acres be the Same more or less. Lying and being in Edgefield district on Cuffeetown Creek waters of Stephen's Creek and Savannah River and adjoining Land held by the Said Josiah Langley and the heirs of Rovert Bell beginning at a White oak corner on the Creek thence South 60 E to 50 chain to Stake, thence N 30 E 27 ch 50 Links to white oak corner, thence Nor 60 W. 50 chains to white oak on Cuffeetown Creek, thence down the Said Creek following the windings and bendings of the Said Creek to the beginning corner, containing one hundred and forty acres; Together with all & Singular the rights members hereditaments and appurtenances the said premises belonging or in any wise ________[?] or appertaining; To Have and to hold all and Singular the premises before mentioned unto the Said Josiah Langley Senr. his heirs and assigns for Ever; and I do hereby bind myself, my heirs Exrs and admns to warrant and for Ever defend all and Singular the Said premises unto the Said Josiah Langley Senr. his heirs and assigns against myself, my heirs and assigns, and against any other person or persons whomsoever Lawfully Claiming or to claim the Same or any part thereof. Witness my hand and Seal this third day of February eighteen hundred and twenty three, and in the forty Seventh year of American Independence Test James Harrison_____________/s/ John Culpepper [Seal] Mathew (his X mark) Rodes__ South Carolina________Personally appeared before me Edgefield District____James Harrison Sn. and made oath that he was present and see John Culpepper Sign Seal and as his Act to deed, Sign Seal and deliver the within instrument of Writing to and for the uses and purposes therein mention, and did also See Mathew Roads with himself Sign his name as a Witness to the due Execution thereof - Sworn to before me this 29th March 1823. __________William Thurmond J.Q_____James Harrison The State of South Carolina____I William Thurmond Edgefield District_____________one of the Justices of the quorum for Said District do hereby Certify unto all whom it may concern that Nancy Culpepper the wife of the within named John Culpepper did this day appear before me and upon being privately and Separately Examined by me did declare that She does freely Voluntarily and without any Compulsion dread or fear of any person or persons whomsoever renounce release and forever relinquish unto the within Josiah Langley his heirs and assigns all her Interest and estate and also all her right and claim of Dower, of, in or to all and Singular the premises within mentioned and released. Given under my hand and Seal this the 29th March 1823___________________________Nancy Culpepper [Seal] William Thurmond J. Q.____Recorded 4th Oct 1828.